Sure, you may know how to sew an elastic casing or how to install a zipper, but do you WANT to? Sometimes you just want to do things the fastest and easiest way. And sometimes you just don’t have enough fabric to do so. 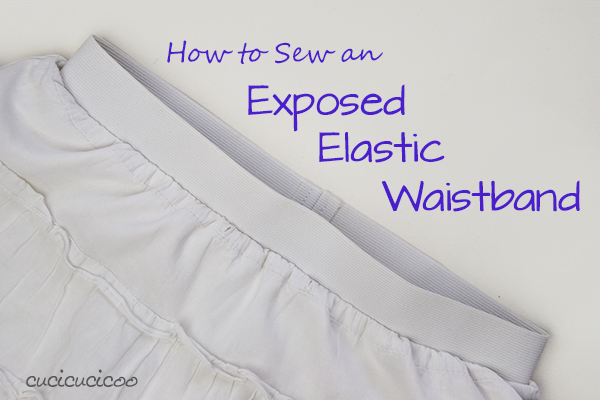 This is when you can resort to the easiest waistband method ever: the exposed elastic waistband! This waistband is exactly what it sounds like: exposed elastic, which is sewn directly onto the top edge of your garment as a stretchy waistband. I’ve started using this solution a lot when refashioning because sometimes I’m just too lazy to pick out the old over-stretched elastic and just cut it off, or because I’m on the tall side and often need to add a little bit of length to my garment, and this method allows you to actually add on length instead of removing it to sew in a casing. For example, when I totally screwed up a pair of leggings, which ended up too tight and too short, I added an exposed elastic waistband to avoid making an elastic casing that would end up halfway down my bum. A perfect fix! Today, as part of my Learn to Machine Sew series, I’m going to show you how to sew an exposed elastic waistband in just five steps! You can practice this technique on any tube of fabric or do as I did, and add it on to a skirt (or pair of pants, shorts or leggings) that has an old elastic that needs to be replaced. 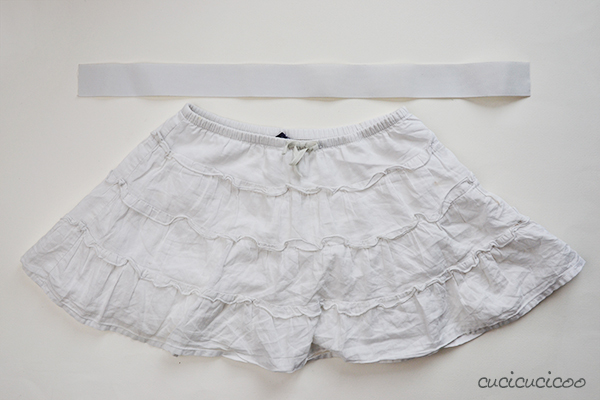 Then in the next tutorial on Cucicucicoo, I’ll show you how to sew a skirt from scratch with this type of easy waistband. In this lesson, I’m using an old skirt that my daughter loves and wears constantly despite its being way too short for her. Last year the elastic had also gotten totally stretched out, so this was a perfect candidate for an exposed elastic waistband. Normally I would be lazy and just cut off the elastic waistband. However this skirt was so short that I couldn’t afford to waste any fabric. So I used a seam ripper* to open up the casing and remove the original elastic. Iron the fabric very well to flatten out the creasing from the original waistband. Sew around the fabric edge with an overlock or zig zag stitch to avoid fraying, unless of course the fabric will not fray. 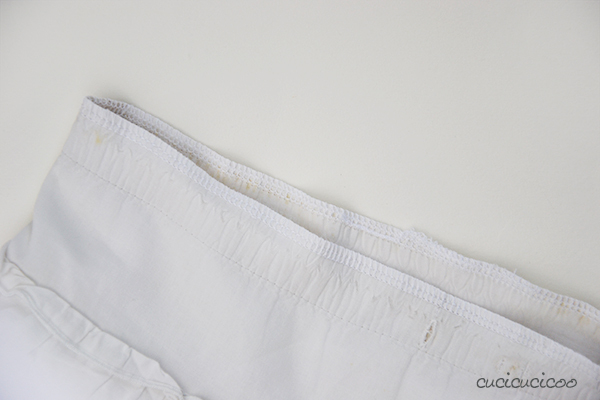 Do not use the standard 2.5 cm (1″) elastic that is generally used in waistband casings. 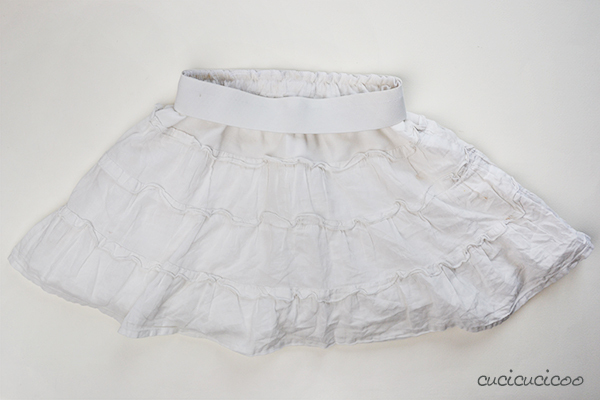 For this type of waistband, you need wide elastic that is relatively rigid. I like woven elastic anywhere from 4-8 cm (1.5 – 3″) wide. I usually use white or black because it’s what I can find the easiest, but the best is when you can find cool colored elastic. Measure around the waist of the person who will wear the garment. If it will be worn on the high/natural waist, measure there. If it will be worn low on the hips, measure there. 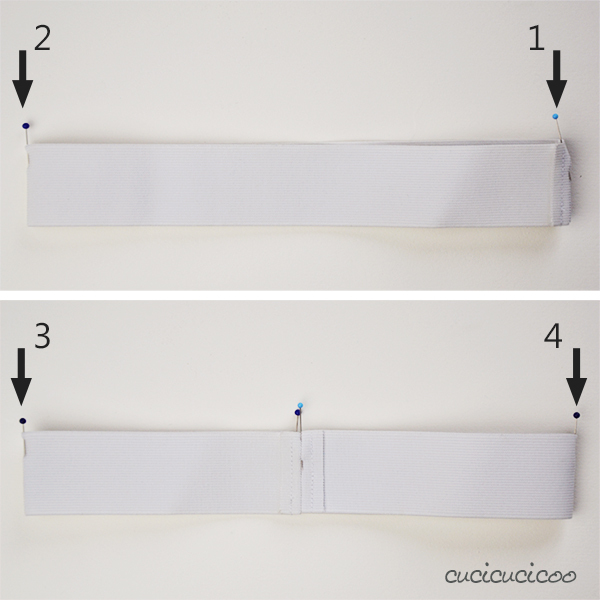 Subtract 2 cm (3/4 inch) and cut the elastic that long. So in my case, Sofia’s low waist measured 56 cm, so I cut a 54-cm length of elastic. 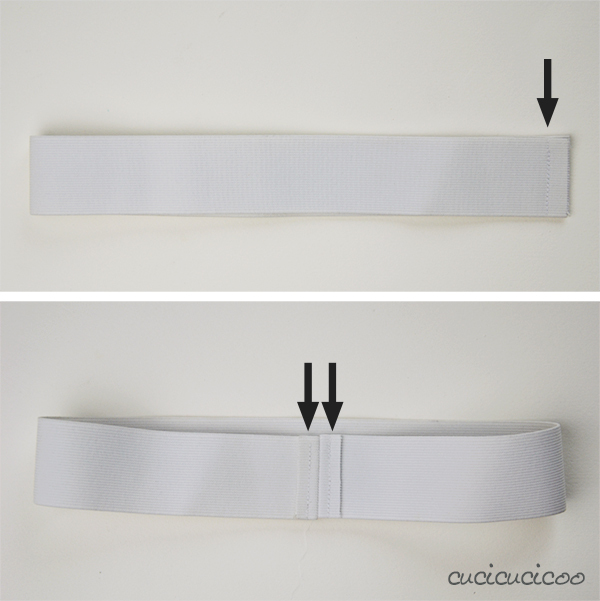 Fold the elastic in half, right sides facing, aligning the two cut edges, and sew them together with a 1 cm (3/8″) seam allowance (top picture above.) Then fold each seam allowance to the side and sew them both down (bottom picture above). There’s the elastic band that will become your waistband. Notice how the raw edges of the elastic are on the wrong (back) side of the elastic. The loop of elastic will now be 4 cm (1.5″) shorter than the original waist measurement. The elastic needs to be slightly snug on the waist to avoid slipping down. Try it on the wearer before attaching it to the garment just to double check that it is comfortably snug. 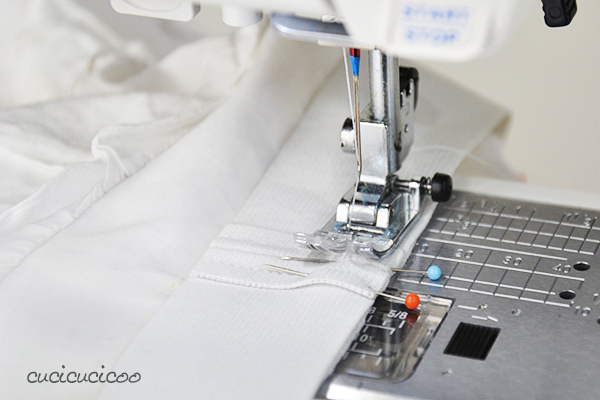 This step is essential to sewing the elastic onto the waistline evenly. Basically we are going to mark each quarter of the way around both parts. Let’s start with the elastic. 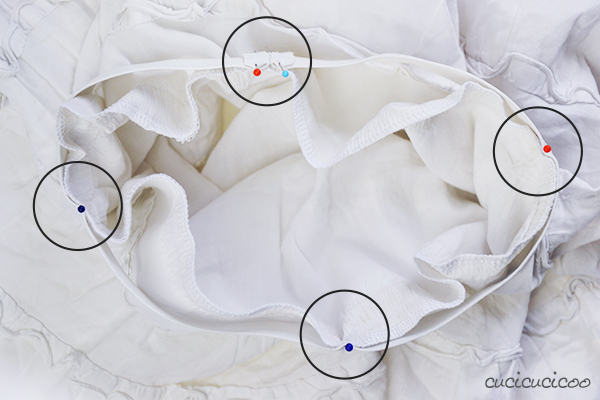 Place a pin at the seam (#1 above). Flatten out the elastic band with the seam and pin #1 to one side, and place another pin (#2) at the other end, opposite pin #1. Now flatten the elastic band with pins #1 and #2 meeting in the middle, and place pins #3 and #4 on the folded ends. Do the same thing with the garment waistline. Always start with seams. 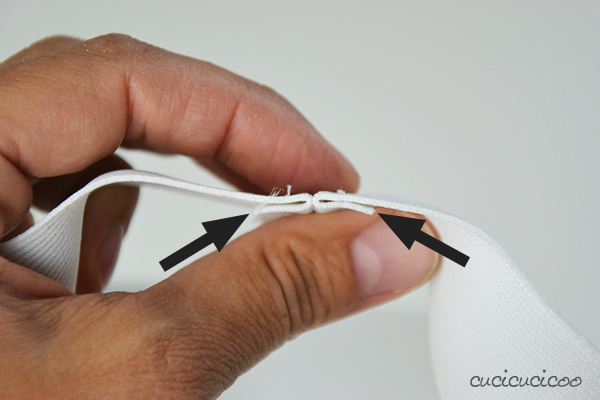 If there’s one back seam, do the same thing as we did with the elastic band. If there are two side seams, as in my case, place pins on those, then flatten the garment waistline with those pins meeting, and place pins #3 and #4 on the folded ends. Now we will join the elastic and the garment waist. Match up the pins marking the seam on the elastic and the back of the garment waist, right sides facing, and pin them together. I use one pin on either side of the elastic seam, as seen above, just to keep it better in place. 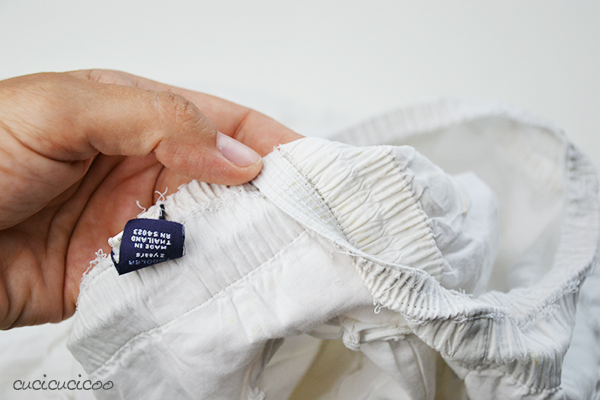 Arrange the elastic so that it is on the outside of the garment and not twisted. Then match up the remaining pins and pin the elastic to the garment waist in those points. Notice that the circumference of the garment waist is much wider than that of the elastic band. That is absolutely necessary in order for the elastic to be able to stretch. Position the back seam of the elastic wrong side up (so that the right side of the skirt is facing up) under the needle with a 1 cm (3/8″) seam allowance. 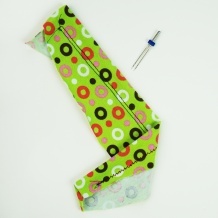 Sew across the band’s folded seam allowances with a straight stitch and stop with the needle lowered. 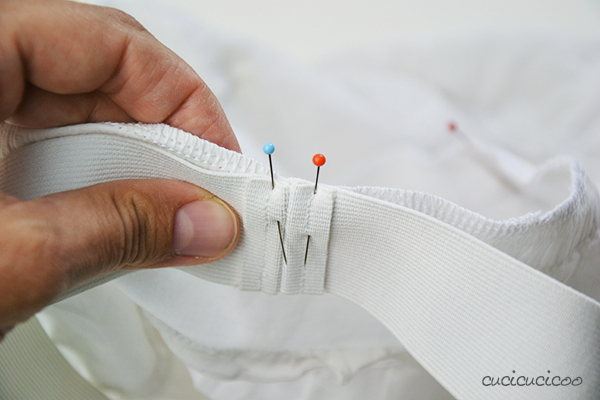 Keeping the elastic stretched, sew until you get close to the next pin. You might want to sew each quarter segment bit by bit, taking pauses to adjust the fabric and your hold on it, so make sure that the needle is lowered whenever you stop and/or release the elastic/fabric. 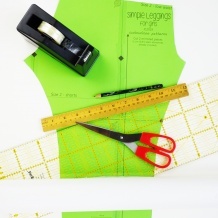 Repeat this step for each quarter segment until you’ve sewn all the way around the waistband. Backstitch at the end, over the folded seam allowances of the elastic. Flip the elastic band up, and you’re done! 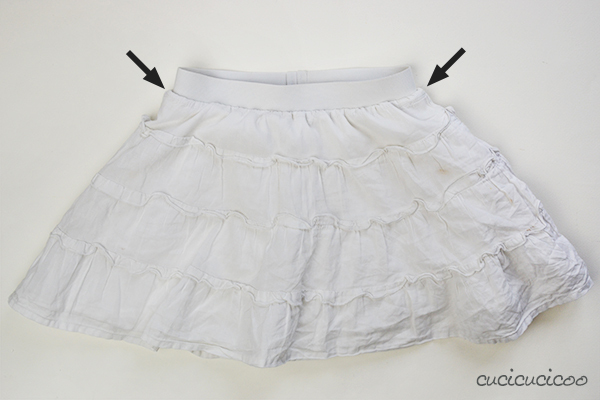 See how the elastic creates little gathers in the skirt fabric? And there you have it! 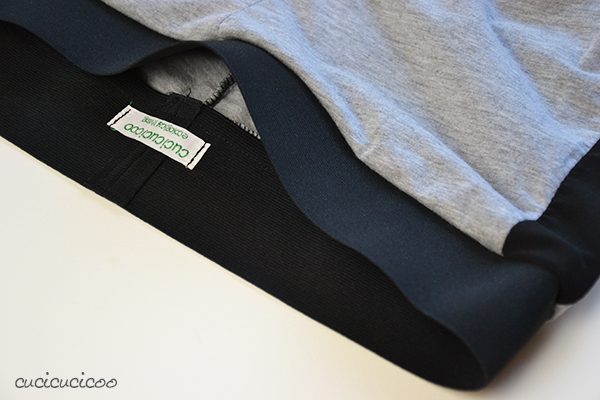 A super easy way to create a quick stretchy waistband! 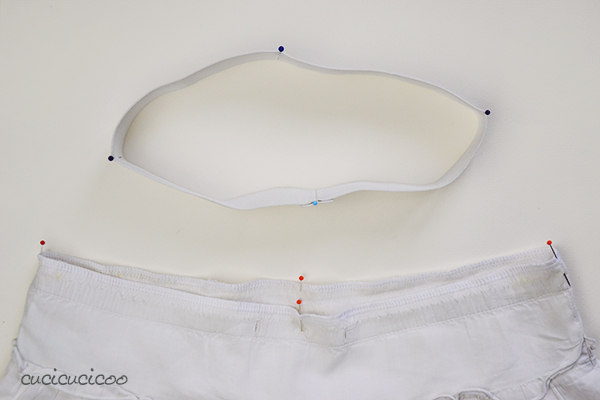 Did you enjoy this tutorial on how to sew an exposed elastic waistband? 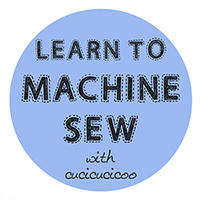 Then check out the other lessons in the Cucicucicoo beginner’s sewing course “Learn to Machine Sew” and don’t forget to come back next week for the tutorial on sewing a skirt with an exposed elastic waistband! ogni volta che leggo una nuova email, trovo interessante qualcosa grazie per queste piccole ma utili idee. 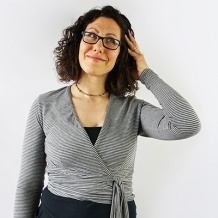 Sono contenta che questa tecnica ti sia utile, Silvana! Non è la tecnica che uso di più, ma a volte è davvero utile! Thank you so much for this clear and detailed tutorial! I’ve been sewing for a while now and I keep avoiding exposed elastic waistbands because I can’t seems to get the right kind of stitch (you’d be surprised how often I have issues with what kind of stitch to use!) and you actually mentioned that I needed to use a straight stitch!! Thank you, thank you!! Hi Nellie, I’m so glad that this is useful for you! You can use other stitches, too. 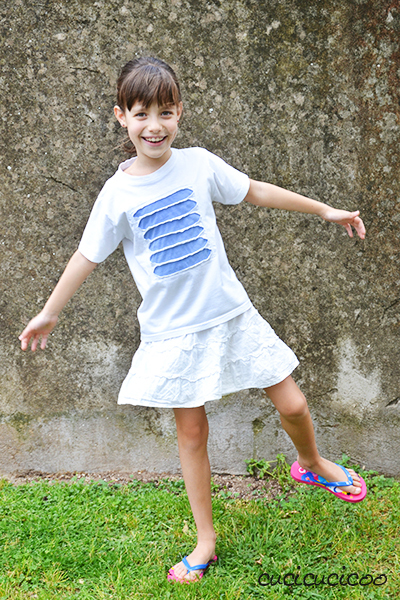 The zig zag is super stretchy, so that way you wouldn’t have to worry about the elastic stretching too far for the fabric. However for this type of waistband, I find that the straight stitch is usually fine. Let me know how it goes! Amanda, I usually sew a casing, too, just because that way it’s easier to exchange the elastic if it gets stretched out or too tight, but sometimes this way is pretty convenient. If you end up with fabric that separates from the elastic, you are probably not lining up the edges of the fabric and elastic while stretching the elastic. You might want to try sewing around the circumference in shorter segments so that you can be sure to sew both layers together. If you give it a try, let me know how it goes! Great idea! Another great thing about sewing skirts for girls is that it takes so much less fabric! 🙂 Let me if you need any more help! You are a miracle with these instructions. I sew so much by hand making stage costumes and more medieval pieces, so having exposed elastic is never in my repertoire. However, the need finally arose and I was clueless as to how to approach this. Thank you so much for this. I can now face this project with more confidence!! Wow, Mindy, medieval costumes must be so much work to make! If you can handle making those, this should be a cinch for you to master! It’s actually very simple once you get the hang of stretching the elastic to match the garment fabric as you sew it. Let me know how it goes! I am a beginner sewer, making costumes for my tap dancing class for a show and you have (pretty much literally) saved us from going on stage half dressed!! Without this tutorial, I would not have been able to attach my costume bits together (non stretchy polyester petticoat to a super stretchy jersey skirt). Can’t wait to read more of your posts! Thanks for the great tutorial. Question: Why do you straight stitch the elastic band on rather than a zigzag or multi-stitch zigzag? Thank you. That’s a great question, Margaret! Actually, it would be better to use a stretchy stitch. In this case, because the fabric was woven and not stretchy, there was no way that the elastic could get stretched any further, but really I will admit that you’re totally right, that one of those stitches would’ve been better! What kind of needle do you use to sew on the elastic? Hi, Jennifer, as a rule, you should use a stretch needle with elastic, though that’s not going to work as well when sewing elastic and woven together. If the fabric has a relatively loose weave, though, it will work fine. If it has a tight weave, you might try a regular universal needle.